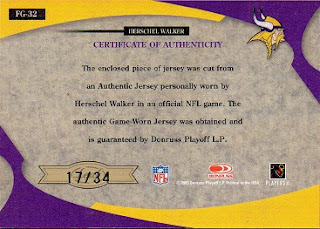 This is a 2005 Leaf Certified Materials card. The subset is Fabric of the Game Jersey # FG-32. The card contains a game used swatch from a jersey worn by Herschel Walker, in an N.F.L. game. The swatch is displayed under a cutout of Walker's uniform number, which was 34. 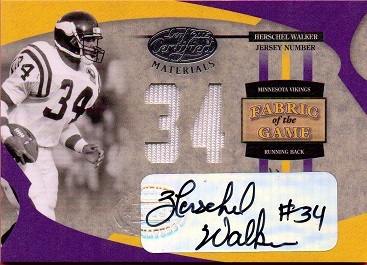 Herschel has also autographed the card. This particular card is #17 out of 34. This is card 583 on my way to 600.